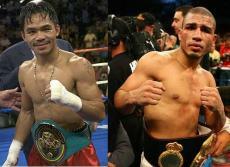 I made this poem after Manny Pacquiao, a Filipino boxer, won his fight over the Puerto Rican boxer, Miguel Cotto. A pair of gloves is needed Shoes and colored shorts Blue, yellow, red and white P-I-N-A-S! His every game is always in luck For he has strong faith from up above That's why \"P\" never lets us down Because of the help and guide of our \"G\"
Wealth and fame he got in his game Million dollars that could make people lame Some are anti while some are pro To the Philippine boxer that we \"WHOA!\"
© Copyright 2019 iamhazelcheng. All rights reserved.